Miri Piri Academy builds Sant-Sipahi--Warrior Saints.Students live and learn in the Khalsa tradition in an atmosphere of discipline, to buildstrength and fearlessness in body, mind, and spirit. Siri Singh Sahib's teachings are thefoundation for the Academys program. The Academy is situated on 17 beautiful acres just outside Amritsar, home of the Golden Temple. 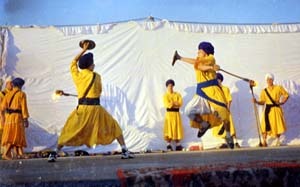 In addition to a full rangeof academic subjects, students study martial arts, sports, music, yoga, 3HO humanology,dancing, drama, Punjabi, art, computer training, and explore their spiritual natures. Theyare challenged by an ambitious adventure program, which includes trips to the Himalayasfor outdoor activities, tours of historic religious sites, and outreach to the Indian Sikhcommunity through kirtan and gatka programs. We are currently enrolling students in grades3-12. Miri Piri Academy is a growing, vital institution. Our goal is to provide a qualityeducation in the Khalsa tradition to all students who seek this reality. The Academy iscurrently offering increased opportunities for enrollment; please contact the U.S. Officedirectly for information. The Academy also is seeking dedicated staff personnel who wantto be a part of this exciting endeavor. Miri Piri Academy admits students of any race, color, and national or ethnic origin. Siri Singh Sahib Harbhajan Singh Khalsa Yogi ji talking inAnandpur briefly about Miri Piri Academy. 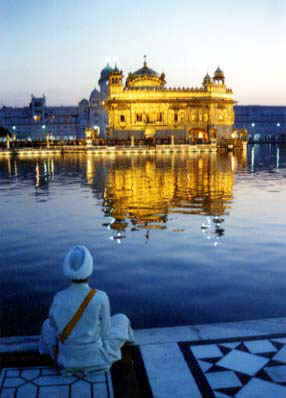 "EarlyApril, 1999 -- Amritsar, Punjab At 3 a.m.,about twenty-five children from Miri Piri Academy arrived to help wash the marble floors ofthe parkarma, the walkway surroundingthe sarovar, the body of water surrounding The Golden Temple. Silently joining the fifty Golden Temple staff sevadars andthe visiting Sikh pilgrims who were granted permission to do this special seva, thestudents quietly carried out this meditative and healing work. Many of the students saidthey have been participating in this seva every morning for the past year. After the floorwashing, all the students gathered at the Akal Takhat to be part of the prakash of theSiri Guru Granth Sahib. 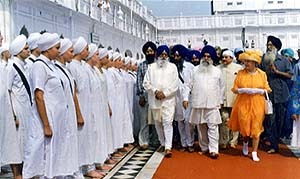 Prakash is the morning ceremony that awakens the Guru from theAkal Takhat and installs him within the Golden Temple. Two of the older boys took turnsplaying the nagara drums; they powerfully pounded out the rhythm. The drums together withthe sound of the Narsingha horns hadquite a dramatic and emotionally stirring effect. 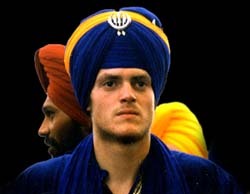 The boys told me later that they havebeen studying with a sevadar from the Golden Temple for over a year in order to earn thisspecial privilege. A short time later, the sky still dark, I saw a row of students taking healing dips inthe sarovar, their heads bobbing up and down in unison in the water. Then a little after 5a.m., the students departed on the bus back to Miri Piri Academy, where they napped beforestarting a new day of classes. We are staying at the Golden Temple guesthouse called Nanak Niwas. The first morning wewere here a sevadar knocked on doors announcing "langar chako" (roughtranslation: Come. Your breakfast langar is ready.). We were already going out the doorsomewhere and so the sevadar let us slip out. On the second morning here, the sevadarappeared with our breakfast in hand. He clearly was not interested in taking "nothank you" as an answer. After an early morning in the powerful, meditative environsof the Golden Temple, I couldnt imagine a more perfect breakfast  freshparantha, yogurt, raw onions and spicy dahl. This was a simple, tasty and healing, andtruly Ayurvedic meal. Such is the hospitality of gurus langar at Nanak Nivas. On Sunday morning a bus was sent to take visiting pilgrims from Nanak Niwas to agurdwara program at Miri Piri Academy, the school where the Sikh children from NorthAmerica, Europe, and India live and study in an uplifting environment. The school is builton land where both Guru Arjun and the soldier-saint Guru Hargobind romped about and playedas children hundreds of years ago. The land is now referred to as Guru Ki Wali, whichmeans: Guru Hargobinds land. 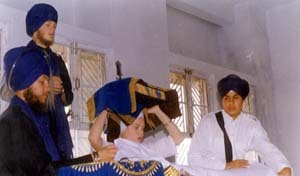 The children of the school managed every aspect of thegurdwara and kirtan. They did this seva with such a spirit that it left me feeling veryelevated, inspired, and blessed."